Samuel L. Jackson is circling Stephen King’s Revival. Gotham teases the return of a comic book face to the show. Get a close look at Chris Hemsworth’s ride in Ghostbusters. Plus, Peggy has a bad idea on Agent Carter, an iconic comic location appears in Supergirl, and more The Hunstman 2 footage. Spoilers now! Latino-Review claims to have revealed a key scene from the movie, which sees Hela, the role purportedly going to be filled by Cate Blanchett, cast Thor out of Asgard... but not before she does some major damage as she takes over Asgard. Not only does she destroy Mjolnir during the attack, she also murders Heimdall. 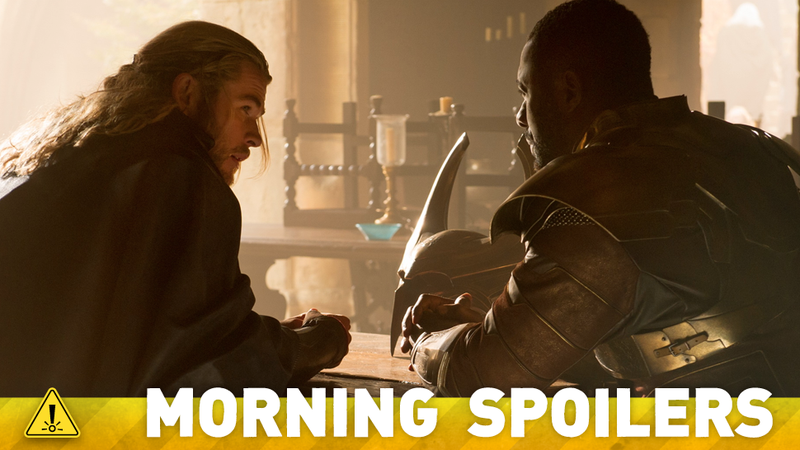 The move makes sense—it’s a big loss for a Thor movie, without having to kill a truly prominent character, and Idris Elba has made it clear that he finds filming Marvel movies torturous. But for now, treat this rumor with a pinch of salt. Entertainment Weekly are reporting that Samuel L. Jackson is in talks to join the Stephen King adaptation. Jackson would play Charles Jacobs, a preacher who begins researching supernatural arts, using the power of electricity, after the death of his wife and child. There’s some new footage to be found in this extended TV spot. It will be identifiable as Azrael in all respects, just a version of him we’ve not seen before, which is the point of doing these! How can we do the character with a fresh twist? Lauren Ambrose still has hopes for a spinoff that features Agents Einstein and Miller. Chris Carter has said that an Einstein-Miller spinoff isn’t officially in the works, but it’s also not off the table. Any update on that front? Deadline has a round up of rumors they’ve heard about the series, including this bullet-point roundup. Peggy has a terrible idea in a new clip from “Life of the Party”. Additional reporting by Gordon Jackson and Charlie Jane Anders. Image: Thor: The Dark World.